Without their leading scorer, Maci Morris, on the court the No. 16 ranked Kentucky Wildcats fell to Ole Miss 55-49 Sunday afternoon at Memorial Coliseum. Freshman Rhyne Howard totaled eight rebounds in the first half, and Keke McKinney added seven of her own. Jaida Roper and Rhyne Howard both lead the Cats with six points each. McKinney added two blocks and Taylor Murray picked up two steals. Howard collected her fourth double-double in the losing effort with 20 points, five of those being three’s and 11 rebounds. Both teams struggled offensively in the early going of this game. They tied it up at 4 apiece when both teams went cold resulting in a scoring drought. Howard ended the drought with a three-pointer and she later added a basket and a free throw to give Kentucky a 12-6 at the end of the 1st quarter. Each team committed 6 turnovers early, resulting in the low score. Cats held Ole Miss to just 3-of-12 shooting from the floor. Kentucky stretched its lead to 14-6 at the beginning of the second quarter on a jumper by Blair Green. Ole Miss would score nine of the next twelve points to cut the Kentucky lead to 17-15. Kentucky would end the quarter with a 21-15 lead going into the locker room. Howard led Kentucky with 6 points, eight rebounds, and two assists. Kentucky grabbed an eight-point lead 25-17 early in the third quarter but Ole Miss rallied with a 10-3 run to cut Kentucky’s lead to one. The Cats scored the next six points, including four in a row by KeKe McKinney. Ole Miss would score the next five points to cut the lead to two before Kentucky got a pair of free throws to end the third quarter with a 36-32 lead. The Cats took an early 38-32 lead in the fourth quarter on a jumper by Green. The Rebels answered by scoring the next five points and getting within one. Green responded for Kentucky, hitting a left-wing three-pointer to give Kentucky a 41-37 advantage. Ole Miss would score the next five points to take the 42-41 lead, they're first since 4-2 in the 1st quarter. Rhyne Howard would hit a shot from behind the arc to give Kentucky a 44-42 lead. But once again, Ole Miss would score six in a row to take a 48-44 lead. 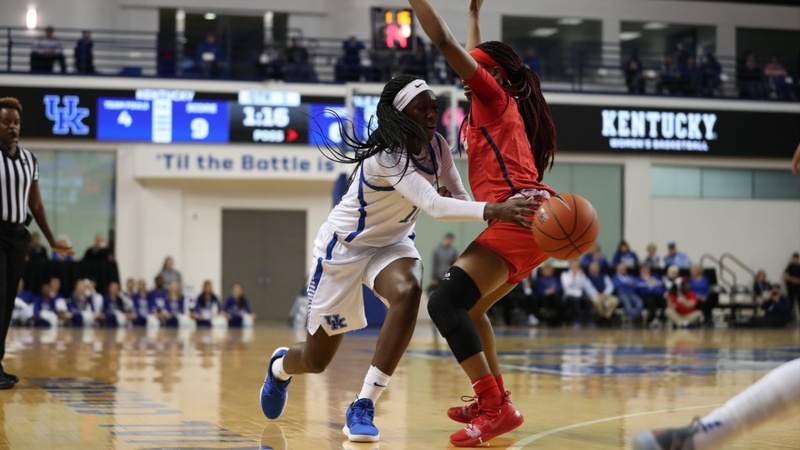 Howard brought the Cats within two but it wasn’t enough as Ole Miss would hit five out of six free throws to seal a 55-49 victory over Kentucky.